You probably heard in the news last week that former Apprentice winner, Stella English, lost her employment tribunal claim against Alan Sugar’s Amshold Group Limited. The employment judge was scathing of her case and said it was a claim that should never have been brought. Although this may look like good news for employers, it’s also a reminder that there is very little to stop a former employee bringing a claim against you, even if that claim is bound to fail. Lord Sugar is quoted as saying that this case shows that employers should stand up to claims such as this. That’s easy for him to say. He can afford to fight a case on a point of principle. Could you afford the fees involved in fighting a case on a point of principle? The average legal costs involved in an employer defending an Employment Tribunal claim is £9,000. I suspect that it cost Alan Sugar at least three times that amount. The Daily Telegraph reports that, although 1 out of 10 Employment Tribunal cases fail, 10 out of 10 cases leave the company with a large legal bill. Not all employers will have a large legal bill – or any bill at all for that matter! Some employers protect themselves by subscribing to an insurance backed employment law service, such as our HR Complete product. HR Complete is a subscription service for employers. 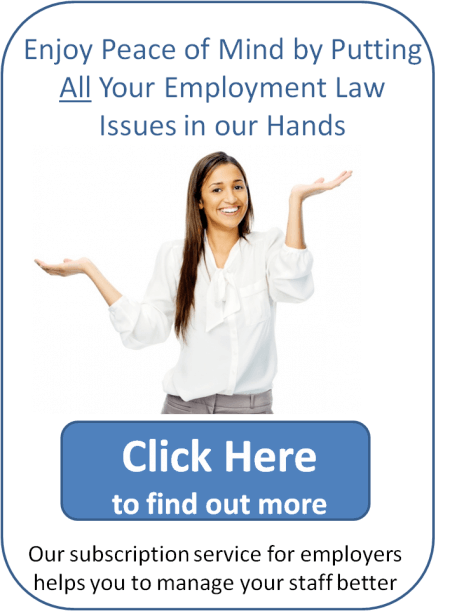 We provide you with all the employment law advice you need. It includes insurance against being taken to a tribunal, which means that, if a former employee does bring a claim against you, the insurers will fund your legal costs in full. Click on the link below to find out how HR Complete can help you to manage your staff and protect your business.